We know you are all trying to get at the top of your game so here is a list of 17 great calisthenic workouts. This is a short excerpt from active.com by Dave Smith. For the full list go here. Getting in shape without access to a gym or any fancy equipment is totally doable. In fact, bodyweight exercises can not only build muscle and burn fat, they've also been shown to improve athletic performance and build speed and strength, too. Make those moves explosive, and they can help build endurance and really help elevate an athlete's game. Before getting started, keep in mind that plyometric training should focus on awesome form and all-out effort. 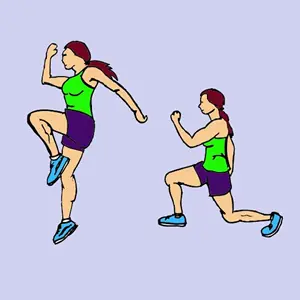 That's why explosive exercises like these are best placed at the start of a workout before muscles are fatigued and performance starts to slow down. When it's time to bust a move, short sets (just 3 to 5 reps) is often all it takes to get a killer workout that may end with jelly legs and an amazing feeling of self-satisfaction. And for those who want to keep the heart rate high between weight training sets, these moves can work well sprinkled in with the rest, says Greatist Expert Joe Venarre. From fiery to flat-out explosive, here are 17 strength- and speed-boosting exercises to get the job done. 1. Reverse Lunge Knee-Up: Begin by standing on one foot (think Karate Kid), then step the opposite foot backwards into a reverse lunge. Powerfully push through the front foot and bring the opposite knee towards the chest. Quickly step back into a reverse lunge and repeat. 2. Plyo Push-Up: Begin in a standard push-up position with elbows bent at 90 degrees and tucked close to the body. Now push it with enough force to jump the hands off the ground and quickly clap together before landing. This one might be best to practice from the knees with the goal of working towards doing them from the toes. 3. Box Drill: Fire up the calves by jumping around an imaginary box. Begin by balancing on the right foot with a slightly bent knee. Swing both arms forward and hop to the left (don't miss the landing!). Staying on the same leg, hop forward, then hop to the right, and finally in reverse back to the starting point. Switch legs and reverse the direction.